Had you read the Daily Express on the 1st September 2015, you could hardly have missed the double page exposé about Advanced Vision Care’s sensational new Alcon Suite and ground breaking Cataract and Lens Exchange treatments now available. The article is all about the 3 reasons why everyone from the Media to our patients trust AVC as the UK’s premier Vision Correction Clinic. While the accolade of press articles written about our clinic may be resounding proof of our success in providing unrivaled vision correction treatments, it is the growing number of our patients leaving stellar video reviews about their experiences that gives us most pleasure and provides genuine reassurance to people considering any form of treatment. Since 2003, thousands of patients have been trusting Advanced Vision Care to treat their vision problems. If you’re considering any form vision correction treatment, it’s critical to do your due diligence on a myriad of factors beyond just price. After all, when you’re entrusting the quality of your eye sight into someone’s hands, it’s important to be certain they know exactly what they’re doing. Surgical results for vision correction are largely determined by the quality of the performing surgeon. Great results require great eye surgeons and that’s perhaps the single biggest factor that distinguishes Advanced Vision Care on Harley Street against the mainstream High Street companies. For those insistent on only the most talented and world renowned refractive surgeons in the world, Advanced Vision Care remains the only choice. Dr CT Pillai is far more than just the lead surgeon and Medical Director at AVC. Aside from an enviable array of ophthalmic credentials (MD DO, FRCS (Edin), FRCOpth (UK), DR CT Pillai has an immense degree of experience and knowledge within the complex laser eye surgery industry. It’s little wonder that 100% of laser patients who undertake surgery with Dr Pillai enjoy driving standard vision, with the vast majority achieving 20/20 vision or better. Over the span of his impressive 25 year career, Dr Pillai has corrected the most complex of prescriptions, and delivered consistently outstanding patient results. Beyond that however, the majority of patients have delivered the feedback that following their consultation with Dr Pillai they felt entirely comfortable and relaxed proceeding with surgery. Patients often comment that his empathetic nature combined with his sincerity in explaining each patient’s unique circumstances had left them feeling encouraged and relaxed with the prospect of treatment. Advanced Vision Care have also spared absolutely no expense in recruiting 2 additional surgeons, both at the very pinnacle of their industry. Dr Goran Helgason is widely known in the field of non-laser treatments, not only for his expertise in Implantable Contact Lens treatment and technology, but also as a course instructor teaching other surgeons. Dr Helgason performs many of the Implantable Contact Lens, Clear Lens Exchange and Cataract surgeries at Advanced Vision Care’s using our new state of the art Alcon Suite. Prof Martin Filipec brings with him 25 years of refractive surgery experience. A graduate from Harvard Medical School is among Prof Filipec’s host of distinctions – he is also a Doctor of Medicine at Charles University in Prague and has Corneal Fellowship from Department of Ophthalmology (Hotel-Dieu, Paris). Advanced Vision Care are truly proud to have them on board supporting Dr CT Pillai in making Advanced Vision Care the leading independent vision correction clinic in the UK. Recently, Advanced Vision Care proudly unveiled its ground breaking new Alcon Cataract/Lens Exchange Suite. The facility, and the technology that powers it, is currently the most advanced private Cataract suite anywhere in the UK. The Alcon Cataract/Lens Exchange Suite comprises of three of the most revolutionary pieces of cataract treatment technology all in one place which is why we are the only clinic to have it in the country. We wrote about this trio of sophisticated equipment – the Verion Image Guided System, the Centurion Vision System and the Luxor LX3 with Q-VUE – on a recent blog post. The Alcon Suite offers Cataract, Clear Lens Exchange and Implantable Contact Lens treatments that are truly second to none. Aside from the technology, one of the main distinguishing factors that sets Advanced Vision Care apart from the rest, is the expert independent advice and bespoke treatment plan that each patient receives. While many clinics have tie-ups and affiliations with specific lens manufacturers, Advanced Vision Care offer a variety of multifocal and trifocal lens from the best manufacturers. This independent stance means patients’ always get the right lens, perfectly customised to their visual and lifestyle needs. Patients’ who do their research before choosing a clinic often tell us how impressed and reassured they feel knowing they will get the best possible lens for their treatment. While we are highly reputed for our Cataract and Lens Exchange treatments, our clinic was initially founded on laser eye surgery. We have the only transparent surgical theatre in Europe allowing our patients’ loved ones to be able to watch treatment as well as being used as a teaching tool for other professionals. We offer LASIK laser eye surgery which is the most popular laser eye treatment in the world. Our LASIK treatment uses Advanced Wavefront IntraLase technology which is the most cutting edge procedure available today, anywhere in the world. The procedure is entirely blade free and in most cases can be performed in less than twenty minutes. Patients are often horrified at how many other clinics offer an inferior version of the technology while performing LASIK. It’s common sense that inferior technology and procedures will risk delivering less consistent results with a far greater possibility of error. Each pair of eyes is starkly different, which further highlights the need for a truly bespoke treatment. 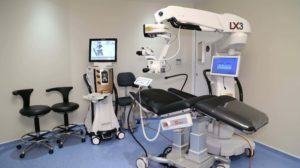 Not all clinics use the best technology and it’s unnerving how some clinics still operate using dated equipment to diagnose and treat patients. Many clinics have affiliations with lens and technology manufacturers which significantly hamper their ability to offer the ideal lens for the patients’ needs. Advanced Vision Care offers truly independent and bespoke vision care using the most advanced technology available. Since 2003, Advanced Vision Care have been proud to be one of the biggest investors in both technology and clinical facilities anywhere in the country. Patients who do extensive research prior to choosing a clinic understand this only all too well. They desire the very best surgeons using the most up to date technology and procedures. That’s why after researching, patients choose Advanced Vision Care for safety, comfort and ultimately brilliant results. At Advanced Vision Care, we aim to provide an unbeatable level of service that spans from your first conversation to beyond your actual treatment date. This is not unnoticed, particularly by patients who have visited other vision correction clinics. Our patients often inform us that the level of knowledge, impartial advice and empathy displayed by the entire Advanced Vision Care team was a major factor in booking a consultation and surgery. In fact, the vast majority of patients who book a consultation at our clinic are so impressed that they go on to book their surgery with us. Patient care is key at Advanced Vision Care which is why we have an independent nationwide optometrist network, allowing our patients to have their aftercare locally. We also provide aftercare that’s included in one transparent price. Patients often explain with exasperation how other clinics they research indulge in sly gimmicks and price bolt-ons, and, by contrast, appreciate the honest and fair prices that AVC offer. A great deal has changed since Dr Pillai treated his first laser eye patient over a decade ago and although vision correction procedures and technology have evolved immensely over time, one important thing has remained constant; the patients’ satisfaction. Patients today are every bit as thrilled with their results at Advanced Vision Care as they were back then.